Disclaimer: These pages (and especially all charts) are for informational purposes only. Most of the numerical data/calculations should be correct. However, YOU make your own decisions as to if you think any analysis, comment or data point/chart is correct or not. All comments posted via Disqus/Google (or any other type) users may/may not be agreed with by yours truly. 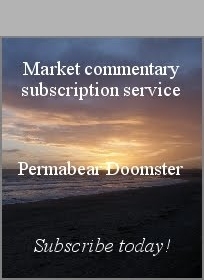 I (Permabear Doomster) am not a financial advisor as officially endorsed by any national government, corporation, financial/securities regulatory authority in neither the USA, UK, or any part of the world. None of the posts/comments in these pages are intended as trading/investment advice. They are merely my opinion on where a given market/stock and any other 'instrument, index, etc' has moved, and/or might move at any future time. I trade mostly in derivatives (Stock Options). Options are extremely volatile, often moving 10x as fast as the main market. For example, a 1% increase in a stock index can easily move related index options by 10%. Options are quite literally NOT for the faint hearted, nor for those who are using monetary funds with which they can't afford to lose. I will NEVER endorse the use of leverage/debt via a margin account for any trader to buy/short-sell stocks/options. I think such a strategy is insane. If you don't have 'spare cash', you shouldn't be involved in any market (whether short/long term, for investment or speculative purposes). Borrowing to trade has ruined many good traders. 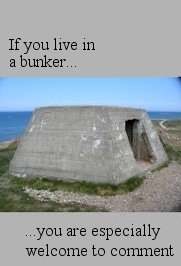 Don't do it! Dear web visitor, please remember, there is always your dedicated local/national Government, or corporate/independent financial advisor/information provider. Those same people all saw the 1999/2000 tech bubble and the 2008 collapse wave coming, and they saved so many good investors their precious life savings.... ohh, that’s right, at least 99% of them didn't. Perhaps you should give them another chance though? I'm sure they'll see the next financial collapse wave coming. Good luck!